Last Gasp 5K Trail Run. 9:00AM CT. Westgate Park, 801 Recreation Road, Dothan, Alabama 36303. 2010 story. Event web page. Larry Dykes, drcprez@yahoo.com or 334-792-6021. 28th annual Bowlegs 5K Run for Scholarship. 9:00am ET. FAMU / FSU College of Engineering, 2525 Pottsdamer Street, Tallahassee, Florida 32310-6046. USATF certified course #FL95008DL. 2011 story. 2010 story. Event page on Facebook. Entry form and flyer. Online registration at RaceIt.com. Larry Giunipero, lgiunip@cob.fsu.edu or 850-878-5569, or Bill Hillison, bhillis@garnet.acns.fsu.edu or 850-893-4557. 35th annual Gulf Winds Track Club 30K / 15K. 7:30 am ET. The Retreat at Bradley's Pond, 9002 Bradley Road, Tallahassee, FL 32309. USATF certified courses FL06013DL (30K) and FL06014DL (15 K). 2011 story. 2010 story. 2009 story. 2008 story. Event page on Facebook. Entry form and flyer. Online registration at RaceIt.com. Jerry/Jackie McDaniel, jackiemcdaniel1@gmail.com or 850-591-0081. 16th annual Museum of Aviation Foundation Marathon / Half-Marathon / 5K. 8:00am ET Marathon and Half-Marathon / 8:15am ET 5K. Museum of Aviation, Hwy 247 and Russell Parkway, Warner Robins, Georgia. USATF certified courses #GA10005WC (Marathon), #GA09003WC (Half Marathon), #GA09005WC (5K). Event web page. Event page on Facebook. Entry form and flyer. Online entry at active.com. Museum of Aviation Foundation at museumevents@museumofaviation.org or 478-923-6600, or John Hunter, Race Director, at hunterjh@cox.net or 478-335-3426. 3rd annual FSU First Responder Unit 5K. 9:00am ET. Florida State University. 2011 story. 2010 story. Entry form and flyer. FRU@admin.fsu.edu or 850-644-3349. Tour de Frenchtown 5K. 8:30am ET. Renaissance Community Center, 457 Virginia Street, Tallahassee, Florida. Event page on Facebook. Jessica White, jwhite@abcnorthflorida.org or 850-687-4421. 8th annual Kiwanis River Run 10K / 5K. 9:00am ET. Earle May Boat Basin, 100 Boat Basin Circle, Bainbridge, Georgia 39817. 2011 story. 10K is on USATF certified course GA05001WC. Entry form and flyer. Online registration at active.com. Lance Wilson, lance.wilson096@cottonstates.com or 229-400-5854. ABAC Fitness Festival 5K and one-mile fun run. 9:00am ET. Red Hills Tennis Complex, Abraham Baldwin Agricultural College, Perimeter Road, Tifton, Georgia. 2011 story. Entry form and flyer. Joe Wilson 229-392-6587, or Jimmy Ballenger 229-391-4939. House of Hope 5K. 8:00am CT. Panama City First Baptist Church, 640 Grace Avenue, Panama City, Florida 32401. Entry form and flyer. Online registration at active.com. Run 4 Missions Four-Mile Run and 0ne-mile fun run. 8:00AM ET four mile / 9:30AM ET one mile. Valdosta State University Baptist Collegiate Ministries Building, 1522 North Oak Street, Valdosta, Georgia 31602. Event web page. Course map. Entry form and flyer. Online registration at RunSignUp.com. Wineland Ribbon Run 5K and one-mile fun run. 9:00AM CT. Boll Weevil Monument, 100 North Main Street Enterprise, Alabama. Online registration at active.com. Kay Franklin, kay.franklin@cancer.org or 334-566-2140. Red Fox Trot 5K and one-mile fun run. 8:00am ET 5K / 9:00am ET one mile. Roberts Elementary School, 5777 Pimlico Drive, Tallahassee, Florida 32309. 2011 story. Entry form and flyer. Kim Vinson, ksvinson@embarqmail.com or 850-488-0923 or 850-668-7430. The 30th annual Hog Wild Run 15K and 5K. 2:00pm CT. The Depot Off Main, 120 Museum Avenue, Dothan, Alabama 36303. 2011 story. Event web page. Larry Dykes, drcprez@yahoo.com or 334-792-6021. Honor Our Neighbor 5K and one-mile fun run. 8:00am ET. McKey Park, 112 Burton Avenue, Valdosta, Georgia 31602. 2010 story. Third annual FSU Krispy Kreme Challenge. 9:00am ET. Westcott Fountain, Florida State University, College Avenue and Copeland Street, Tallahassee, Florida 32310-6046. 2011 story. 2010 story. Suzanne Berkey, smb07h@fsu.edu or 727-459-8597. 20th annual Run For The Cookies 5K and one-mile fun run. 8:30AM ET one mile / 9:00AM ET 5K. Tallahassee Community College Lifetime Sports Center, 444 Appleyard Drive, Tallahassee, Florida 32304. 2011 story. 2010 story. USATF certified 5K course FL08011EBM. Dr. Jeanne O'Kon, okonj@tcc.fl.edu or 850-894-2019. 15th annual Sweetheart Run 5K and one-mile fun run. 9:00AM ET 5K / 9:45 AM ET one mile. Rehabilitation Services of Tifton, 1488 Old Ocilla Road, Tifton, Georgia. 2011 story. 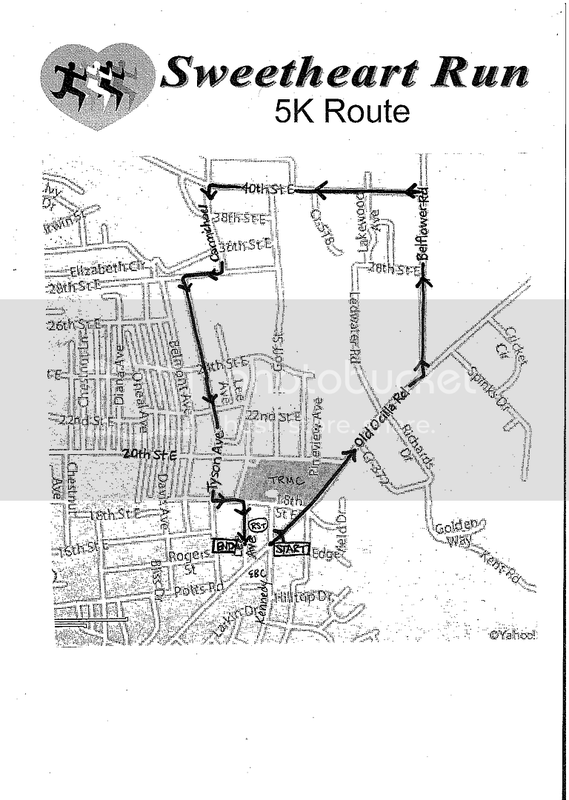 5K course map. Event web page. Entry form and flyer. Sommer Dunston, rst.sdunston@yahoo.com or 229-386-5200. Southeast Alabama Community Foundation Half Marathon. 8:00AM CT. Flowers Hospital, 4370 West Main Street, Dothan, Alabama. Event web site. Course map. Online registration at active.com. Blue-Grey 5K. 7:00AM ET. Columbia County Courthouse start 173 NE Hernando Ave, Lake City, Florida. Online registration at active.com. Run for the Nurses 10K, 5K, and one-mile fun run. 8:00AM ET 10K / 8:10AM ET 5K / 9:15AM ET one mile. Red Hills Tennis Complex, Abraham Baldwin Agricultural College, Perimeter Road, Tifton, Georgia. Online registration at active.com. Becky Arnold at rarnold@abac.edu or 229-391-5024. Strides For Scholars 5K. 8:00AM CT. Nelson Building, 1311 Balboa Avenue, Panama City, Florida. Online registration at active.com. Chautauqua 5K. 8:00am CT. The Amphitheater on Circle Drive, DeFuniak Springs, Florida. Entry form and flyer. Chris Guzowski, dfswomansclub@gmail.com or 850-892-5615. Red Pepper Run 5K. 8:00am ET. The Blue Parrot, 68 West Gorrie Drive, St. George Island, Florida 32328. 2011 story. Event web page. Susan Bassett, 850-323-0092. Race The Tortoise 5K. 8:00am ET. O'Leno State Park, 410 S.E. O'Leno Park Road, High Springs, Florida 32643. USATF certified course #FL09012EBM. Online registration at active.com. V. Morgan Tyrone, Victor.Tyrone@dep.state.fl.us or 386-454-0723. Shamrock Scurry 5K and one-mile fun run. 8:00AM ET one mile / 8:30AM ET 5K. Killearn United Methodist Church, 2800 Shamrock South, Tallahassee, Florida 32309. 2011 story. 2010 story. Event web page. USATF certified course #FL10021EBM. Course map. Connie Clark, rclarke54@comcast.net or 850-933-2429. 34th annual Winston Howell 10,000 Meter Road Race. 9:00am CT. National Guard Armory, Highway 52 and 167, Hartford, AL 36344. 2011 story. USATF certified course #AL96005JD. Event web site. Cary Hatcher at hatch@alaweb.com or 334-588-2343. 3rd annual Florida Sheriff's Youth Ranches, Marathon, Half Marathon, 10K, and 5K. 7:30am ET. Florida Sheriff's Youth Ranch, 1813 Cecil Webb Place, Live Oak, FL 32060. USATF certified course FL10028EBM (Marathon & half-Marathon), Event web page. Entry form. Online registration at active.com. Chris Carusone, 941-799-7184. Second annual Doggie Dash 5K and one-mile fun run. 9:00am 5K / 9:30am one mile. John Paul II Catholic High School, Grove Park Drive at Terrebonne Drive, Southwood, Tallahassee, Florida. 2011 story. Chris Akins or Sheri Logue, info@correctionsfoundation.org or 850-410-4475. Third annual Pilot 5K for Brain-Related Disorders. 7:00am CT. Frank Brown Park, 16200 Panama City Beach Parkway, Panama City Beach, Florida. Online registration at active.com. Legacy Run for Life 5K and one-mile fun run. 9:15am ET 5K / 10:00am ET one mile. Legacy Park -- Sherwood Baptist Church Sports Park, 2911 Leary Rd, Albany, Georgia. 2011 story. USATF certified 5K course #GA11088WC. Event web page. Entry form and flyer. Mike Johnston, nmikej@sherwoodbaptist.net or 229-883-1910x1353. Third annual Moving in Memory of Marline 10K, 5K, and One-Mile Fun Run. Marina Civic Center, 8 Harrison Avenue, Panama City, Florida 32401. 2011 story. Online registration at active.com. Eighth annual Valdosta Junior Service League 'Dosta Dash 10K, 5K, and one-mile fun run. 8:00am ET 10K & 5K / 9:30am ET one mile. Converse-Dalton-Ferrell House, 305 North Patterson Street, Valdosta, Georgia 31601. 2011 story. Online registration at RunSignUp.com. Get Active Running & More, 229-219-0010. Fire Ant Festival 5K. 8:00am ET. Turner County Special Services School, College Avenue and Gilmore Street, Ashburn, Georgia 31714. 2011 story. Event web page. Anglers on the Run 5K and one-mile fun run. 8:00AM CT. Deer Point Elementary School, 4800 Hwy 2321, Panama City, Florida. Online registration at active.com. Third annual Cody Climb 8K. 37th annual Springtime 10K, Publix 5K & Target 1-Miler. 7:45am ET one-mile / 8:10am ET 10K and 5K. Leon County Courthouse, 301 S Monroe St, Tallahassee, FL 32301. 2011 story. 2010 story. 2009 story. Event web site. Judy Alexander, jalexander98@comcast.net or 850-383-1361. First Fruits 5K and one-mile fun run. 8:00AM CT. Kinsaul Park, 5th Street, Lynn Haven, Florida. Online registration at active.com. Jeff Tinch, 850-785-7625. 3rd annual Junior Service League of Panama City 5K Rabbit Race and ½-mile Bunny Hop. 8:00am CT. Panama City Marina Civic Center, 8 Harrison Avenue, Panama City, Florida 32401. Online registration at active.com. 12th annual Red Hills Triathlon (1/3-mile swim, 16-mile bike, 3.1-mile run). 7:30am ET. Maclay Gardens State Park, 3540 Thomasville Road, Tallahassee, Florida 32309. 2011 story. 2010 story. 2009 story. Event web site. Online registration at active.com. 38th annual Palace Saloon 5K. 8:00am ET. James Messer Fields Park, Jackson Bluff Road and Dupree Street, Tallahassee, FL 32304. USATF certified course FL99027DL. 2011 story. 2010 story. 2009 story. Event web site. Third annual Darton College Go Global 5K and one-mile fun run. 8:30AM ET. Darton College Tennis Pavilion, Darton College, Albany, Georgia 31707. Event web page. Online registration at active.com. David Mann, david.mann@darton.edu or 229-317-6588. Bainbridge Half Marathon. 7:00AM ET. Memorial Hospital, 1500 E. Shotwell Street, Bainbridge, Georgia. Event web site. Smiling Pig 5K. 8:00AM CT. Citizens’ Lodge Park, 4577 Lodge Drive, Marianna, Florida. Event web page. 35th annual Rose City Run 10K and one mile kids' run. 8:00 am ET 10K / 9:30 am ET one mile. North Broad Street and Monroe Street, Thomasville, GA. USATF certified course GA92011WN (10K). 2011 story. 2010 story. Event web site. rcr@ymcathomasville.org or 229-226-9878. 11th annual Tallahassee Tails & Trails 10K, 5K, and one-mile fun run. 8:30am ET. Tallahassee-Leon County Animal Service Center, 1125 Easterwood Drive, Tallahassee, Florida 32311. 2011 story. 2010 story. 2009 story. Event web site. 30th annual Gulf Coast Triathlon (half ironman). 6:15am CT (first wave). Event web site. gulfcoasttri@yahoo.com or 850-235-0720. 15th annual Potluck Bash 4-Mile Run. 6:00 pm ET. Forestmeadows Athletic Center, 4750 North Meridian Road, Tallahassee, Florida. 2011 story. 2010 story. 2009 story. David Yon, david@radeylaw.com or 850-425-6671. Loop The Lake 5K. 7:30 am ET. Lake Blackshear Resort and Golf Club, 2459-H US Highway 280 West, Cordele, GA 31015. Event web site. Online registration at active.com. info@loop-the-lake.com or 229-446-4550. 14th annual Summer Sizzler 5K and one-mile fun run. 7:00 pm ET (1 mile), 7:30 pm ET (5K). St. George Island, Florida. 2011 story. 2010 story. 2009 story. USATF certifed course #FL99035DL. Event web site. Hobson Fulmer, hobson@fairpoint.net or 850-927-2510. 34th annual Hot Trot 5K. 7:30 am CT. Washington-Holmes Technical Center, 757 Hoyt Street, Chipley, Florida 32428. 2011 story. Stan Owens 850-547-2244. 30th annual Greensboro Kiwanis Club's Firecracker 5000. 7:30am ET. Greensboro Town Hall, 150 E 11th Street, Greensboro, Florida. 2011 story. 2010 story. 27th annual Critter Run 5K. 6:00 pm CT. Westgate Park, 801 Recreation Road, Dothan, AL 36303. USATF certified course #AL86003JD. 2011 story. 2010 story. Event web page. Event entry form. Larry Dykes, 334-792-6021. Possum Trot 5K. 7:30am CT. Wausau, Florida. 2011 story. Frank or Carol Kreis, 850-773-2030. Georgia Veterans Sprint Triathlon (400 yard swim / 13.6 mile bike / 5K run). 7:45am ET Duathlon / 8:00am ET Sprint Triathlon. Georgia Veterans State Park, 2459 U.S. Highway 280 W, Cordele , GA 31015. 2011 story. Event web site. Online registration for sprint triathlon at active.com. Sprint triathlon entry form and flyer. Jim Rainey, Georgia Multisports Productions, jim@gamultisports.com or 770-926-2367. GWTC Miller Landing Madness 8K/5K/3K. 8:00 am ET. Elinor Klapp Phipps Park, Miller Landing Road, Tallahassee, FL 32312. 2011 story. 2010 story. 2009 story. Tom Perkins, 850-894-2019. Baker University cross-country runner Aaron Caldwell turned in a 74:07 half-marathon to win the third annual Run For The Redfish in Panama City Beach on Saturday morning, 3 December 2011. Caldwell's time was a new course record for the event, and put him a good 1300 meters ahead of the runner up, Eric Larson (2nd, 78:52), another Baker University runner. 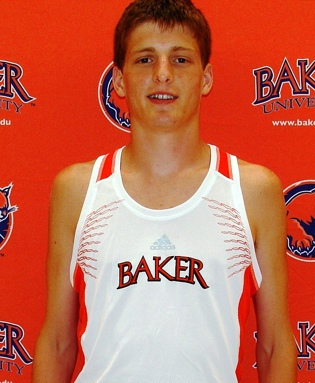 In all, the visiting Baker University Wildcats accounted for 12 of the top 15 men's places. Panama City's Aaron Scrimager (6th, 82:21) was in fact the first non-Wildcat in the race. But the college men were too young to qualify as masters, and the first master in the half marathon was Jimmy Railey of McHenry, Maryland, who placed 11th overall in 88:14. Line Lauritsen of McHenry, Maryland took top female honors in the half marathon, finishing 12th overall in 88:14. Lynn Haven's Kristin Petersen was the women's runner-up, posting a 94:11 to finish 19th overall. The next two women were more Baker University athletes, Ashley McBride (24th, 96:48) and Kerry Kurta (25th, 97:15). Diane Morris (56th, 1:46:43) was the first woman master and the 12th woman finisher. 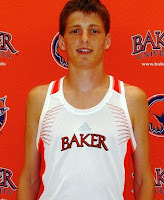 So why were all those Baker University runners doing so far from their campus in Baldwin City, Kansas? Well, the NAIA cross-country championships were two weeks before the Run For The Redfish, and Panama City Beach has to look like an attractive destination for a post-season trip, especially from Kansas. But the half-marathon also opens the track-and-field season for the Wildcats. The marathon is one of the events contested in the NAIA track-and-field championships, and athletes can qualify for the NAIA marathon with a fast enough half-marathon time. Aaron Caldwell's 74:07 was under the NAIA provisional standard of 75:00, but not quite fast enough to make the automatic qualifying standard of 73:00. In addition to competing in the Run For The Redfish, the Wildcats also completed a service project during their sojourn in Florida. The third annual Run For The Redfish half marathon was the largest yet, with 350 finishers. 2010 story, "Norton and Nyquist nail the Run For The Redfish Half Marathon"
Choose your next race from the latest schedule at Trouble Afoot! Eight miles east of the Florida capitol at Apalachee Regional Park on Saturday morning, 17 December 2011, Chris Lake flew through six kilometers of cross-country running to win Gulf Winds Track Club's Tannenbaum Trail 6K in 19:49. About 150 meters back, Maclay School assistant cross-country coach Stephen Cox finished runner-up in 20:21. Maclay's head coach, Gary Droze, was the fastest master in the race, placing seventh overall in 21:16. Katie Showman of Tallahassee was the first woman finisher, 29th overall in 25:33. Thomasville's Mary Anne Grayson was the women's runner-up and top woman master, running 26:46 for a 42nd-place overall finish. Usually the Apalachee Regional Park Trail is the venue for a scholastic cross-country meet, whether at the middle school, high school, or collegiate level. At the Tannenbaum 6K, it was just a bunch of people who love to run assembling on the starting line, nearly 200 of them. Sure, there were some cross-country team members there, but they weren't competing in their school colors. The race started soon after 9:00AM. After half a kilometer a lead group of five runners was pacing the field--Vince Molosky, Chris Lake, Stephen Cox, Wakulla High's Stanley Linton, and Carolina Upstate cross-country runner Riley Doherty. Shortly after the end of the first kilometer (3:13) the leaders dropped Doherty and the lead group was down to four. Molosky was the next to go, and there were three runners fighting for the lead at two kilometers (6:28). Winding through the jungle on the third kilometer, Maclay School coach Cox pushed the pace and lost Linton. Cox couldn't shake off Lake, though, and at the Wall, the steep rise before the runners left the woods to return to the starting field, Lake burst ahead and took command of the race for good. Lake hit the halfway mark in the lead with a 9:47 split, then ran home alone to a 19:49 win. Cox clung to second, finishing runner-up in 20:21. Charlie Johnson had stalked the lead pack throughout the race, picking off Doherty, Molosky, and Linton as they fell off the pace, ultimately finishing third in 20:29. Linton was fourth in 20:35, and Molosky fifth in 20:55. Behind Mike Nesius (6th, 21:01), Gary Droze was first master, placing seventh overall in 21:16. Tallahassee's Katie Showman grabbed the women's lead early in the race and was never seriously challenged, going on to finish 29th overall in 25:33 as the first female. Kate Chunka of Tallahassee trailed Showman in second for the first four kilometers, but on the second loop Thomasville (Georgia) master runner Mary Anne Grayson picked off Chunka to take the women's runner-up spot, placing 42nd overall in 26:46. Chunka (45th, 27:08) was the third woman in, and Tallahassee's Sandy Holt (49th, 27:46) was the fourth woman finisher. More than a few area athletes liked the idea of a mid-December race; 173 finished the Tannenbaum Trail 6K. Each finisher received a pair of lightweight running gloves, a change from the usual T-shirt. Overall and age-group winners were awarded a poinsettia plant. Leon County's Apalachee Regional Park Trail was in its third year in 2011, but there were still many people who hadn't heard of the trail, and even more who hadn't run on it. December seemed like a good time to have a race to showcase the trail, the only dedicated cross-country running facility in the area. In December the weather is great for distance running, the trail is still well-groomed from cross-country season, and there aren't that many races on the calendar. Nationwide, there are probably hundreds of December holiday runs, but unlike the November crop they aren't all named "Turkey Trot." There are loads of Jingle Bell Jogs, Reindeer Runs, and Santa Strolls of various lengths. There's even a "12 'K's of Christmas," which I wish I'd thought of first. But if there's already a Tannenbaum Run or even a Tannenbaum Trail Run, I'm willing to wager that there's not a Tannenbaum 6K. Not that six kilometers is an entirely unheard of distance, even if it is somewhat unusual. The women's championship distance in NCAA cross-country competition is six kilometers. Internationally, the junior (19 and under) women compete at 6K in the world cross-country championships. Tallahassee itself has already had 6K races on the road at the Flash 12K and cross-country at the Run Wild 6K.